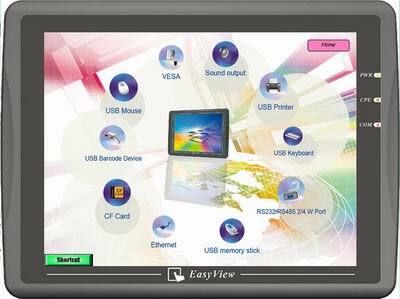 MT6000&MT8000 series is the new HMI generation of EasyView. With the design concept of meeting customers’ satisfaction while easy-to-Use attribute as before, a MT8000 not only performs as a Human Machine Interface but also plays as a role of data center. Through the most popular Ethernet connection, data can be shared among MT8000s without limitation and any SCADA/HMI software on the PC can simply access data from MT8000s.MT8000 series is the best choice for your requirement tomorrow. Featured by high reliable industrial analog resistive touch panel, MT8000 perform high touch accuracy. With high hardness and long lifetime, they will conform to your need of industrial environment. Tip the screen and experience the speedy processing of 32 bit RISC Processor. Equipped with 32 bit RISC processor, MT8000 perform superior functionality. Even the most complicated screens can be displayed instantly. MT8000 are able to communicate with most of PLCs and transfer data without executing any additional program. High-quality color display provides superior clarity and wide viewing angles. Each component of MT8000 is meticulously selected to fulfill the requirements of the modern industrial environment. High Reliability: Endure at least 1 million continuous operations. High Sensitivity & High Accuracy: Trigger off a response only by a tip. Dedicated Overlay: Protect the display and prolong its lifespan. High Contract & High Brightness LCD. MT8000 support 65536[16bit] colors and provide finer and more vivid visibility Quick response in screens exchange; Smooth screens switch without flashing. Clearly exhibit pictures, text and GIF dynamic file. Each MT8000 is equipped with 3 serial ports which can connect with 3 different PLCs/controllers simultaneously. which are not only for project download/upload and data storage but also for connection to printer, bar code reader,mouse and a variety of USB devices. with fast speed. Besides, any MT8000 can access data from other MT8000s. Users can also download project/data via Ethernet in a short time. 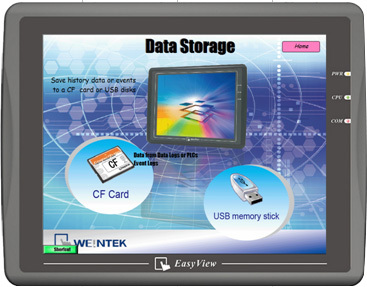 MT8000 Series provide standard CF Card slot to improve the efficiency of recipe file, data logging and project downloading as well as simplify the data processing. MT8000 are able to send out both audio and visual alarm timely when error condition/environment occurs. Change to Portrait Mode to meet your control panel design. Support Bold font, Italic font, underline, glitter, marquee… etc. Support UNICODE; Multiple languages can be displayed on-screen. Simulate the operation of MT8000 directly on PC without MT8000 and PLC. 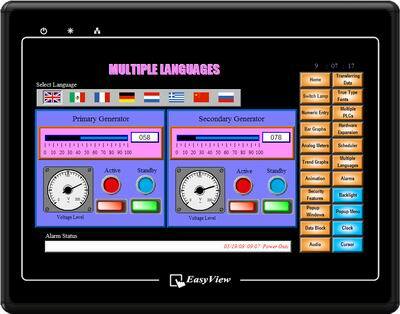 Run multiple simulation screens simultaneously on a PC and monitor the data of many MT8000s. MT8000s are equipped with CF card slot. 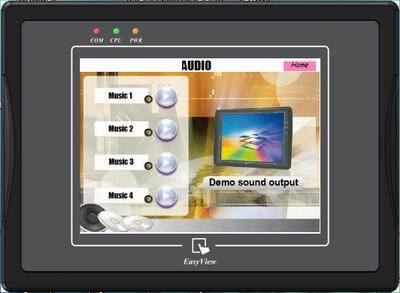 Using CF card to download the project from PC to HMI is simple and fast. Besides, USB stick memory is another good choice for convenience. Up-to-date Ethernet download ing design helps you to update projects to remote HMI anytime and anywhere. Provide optional OPC (OLE for Process Control) server to enable SCADA system to access data from PLC and HMI via Ethernet and MT8000. MT8000 Master/Slave OPC Server supports all of the PLC drivers available for MT8000 series.